Most people have a hard time smoking deer because it dries out real easy. I always had that problem as well until I figured it out. I have done it this way for years and it’s super easy. 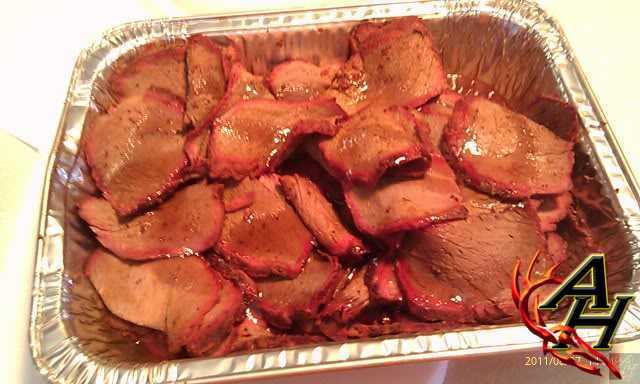 Here is how I smoke deer and it’s always a guaranteed hit. 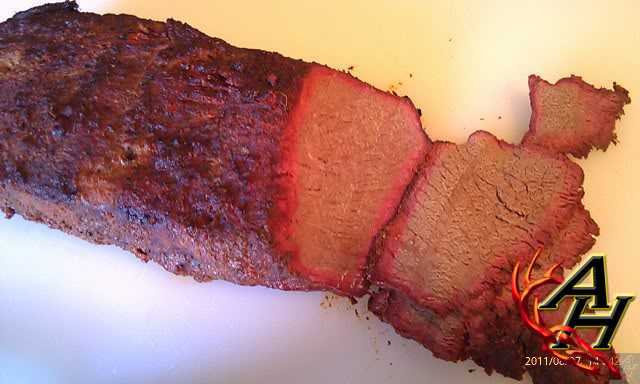 If you don’t have a smoker yet, read some reviews and pick up an affordable one. I don’t know what I grabbed as far as the deer roasts. Might have been off a leg or a loin. It really doesn’t matter smoking it this way as all ends up juicy and tender. One thing with venison is that since it doesn’t really have any fat in the meat, it gets up to temp quick. So keep the smoker temp down to the 210 range. I put these three roast on and smoked them till the temp got up to 145-150. That took about 3-3.5 hours. Once they get up to that temp I put them in a pan and pour a liquid of your choice in there. I usually use beer by its self but you can let your imagination run with it. Then keeping the temps low, take the meat up to 165. At that point, the meat is done. NEVER smoke or cook deer to any temps over 165 because it will get dry and tough. You can pull the deer off anywhere between 155-165 and move onto this next step. Once the venison hits that 155-165 range, I take the meat and slice it up. 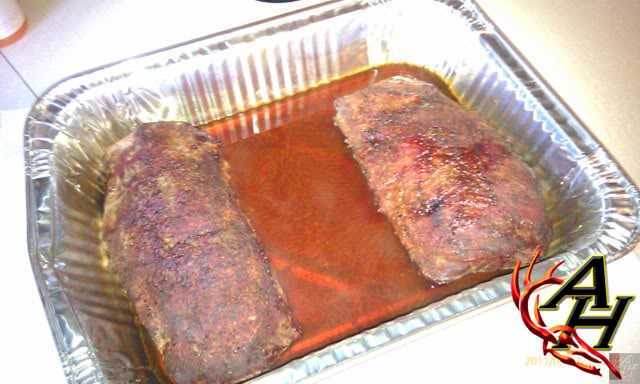 Then its back in the pan, more liquid added, cover in foil and back on the smoker for about 45 minutes to an hour. Today I put some cider vinegar and maple syrup in the sliced meat. After its sat in the smoker for a bit, all those juices soak back into the meat for awesome goodness. 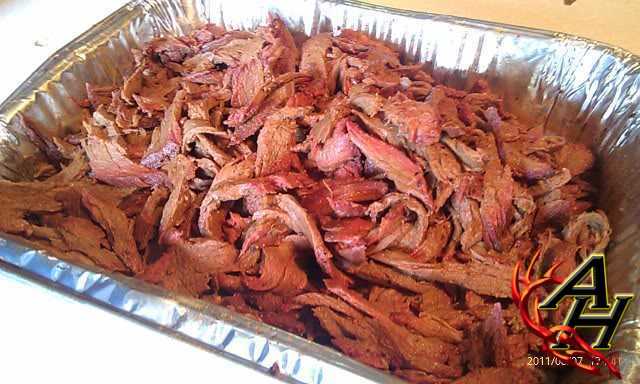 Usually, I just take the sliced meat and make sandwiches with it, but everything was so tender I just took all the sliced venison and pulled it all. It came apart with ease and was oh so good. Hope y’all get to try this. If you need some deer, stop by and I will give you some. I still have a freezer full and the season is about to begin. 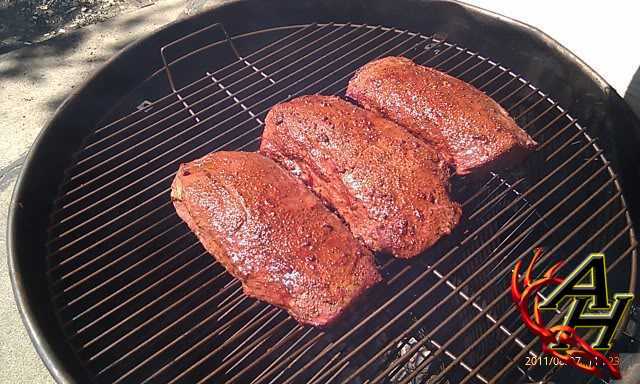 Here’s another video I did on smoking venison.